I absolutely love a kitchen that is decorated with farmhouse kitchen decor. There’s just something about the simplicity of the designs that call to me. What I don’t love is spending stupid crazy dollars to buy my home decor. I like budget friendly decor. It’s my favorite and I’m sure it is yours too. If you’re anything like me, you want to change your decor theme every few years which means you really do need to be mindful of what you spend to decorate. If you aren’t mindful, you could end up wasting away your entire bank account decorating one room. 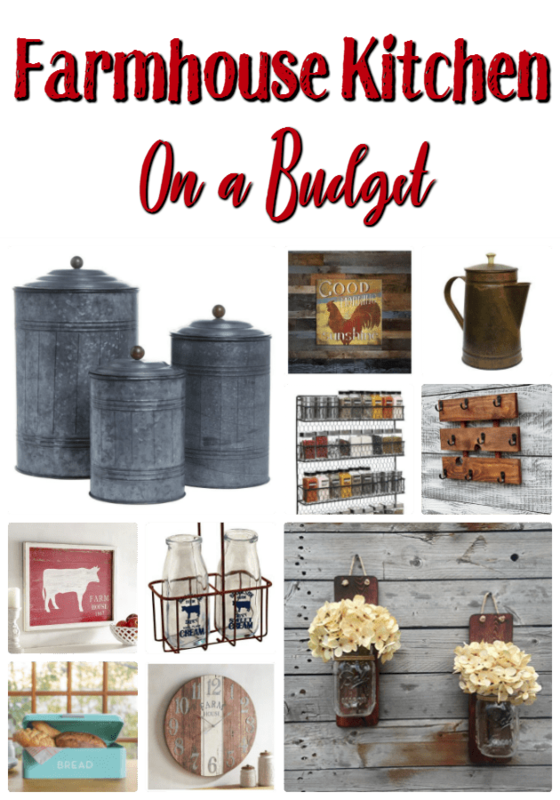 Which is why I wanted to help bring you a few farmhouse kitchen decor options that really won’t break your family budget. 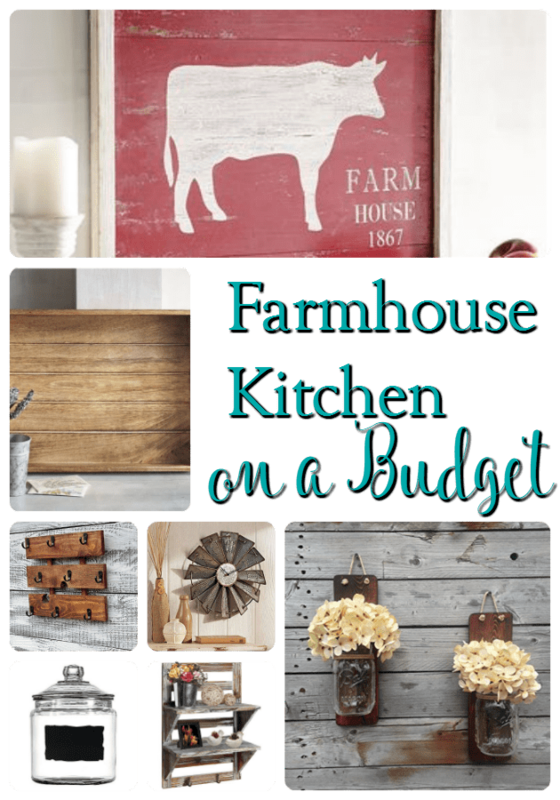 These farmhouse kitchen decor items won’t break your budget and they will look fantastic in any kitchen! I had so much fun putting this together for you that I may just have to work to boost my savings account to redecorate my own kitchen! A farmhouse kitchen is usually really simple. You can use accessories to create the look that y ou want without doing any major remodeling projects or any costly projects. Since the accessories are usually pretty simple by themselves, combining them can can create a that simple, but clean farmhouse kitchen look that you want and help you get the look for less than you might think. Looking for farmhouse living room decor? My good friend over at The Frugal Navy Wife has a great get the look for less for Farmhouse Living Room Decor. 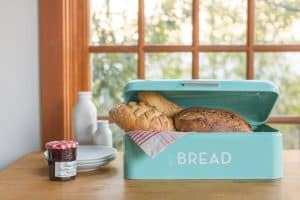 No one likes having bread bags just lying around on the counter which makes the Now Designs Bread Bin the perfect option for your farmhouse kitchen decor. It’s simple, comes in 4 different colors to match any color palette and is a great price too! I actually own this exact one in the turquoise color shown in the photo above and love it! It’s so simple and looks amazing! 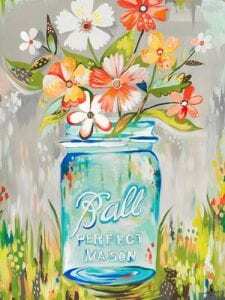 I love mason jar decor and have been drawn to this Perfect Mason Jar Wall Decal since the first time I saw it. It’s incredibly simple but incredibly pretty! It’s a fantastic price which makes it a great option for anyone that was looking for farmhouse kitchen decor at a great price. I think that if I were to pick one of these up, I would use it as part of a custom backsplash behind my stove. I love my morning cup of coffee, but I hate having a cupboard full of coffee mugs. This Rustic Reclaimed Wood Coffee Mug Holder solves that problem and it does it with style! This bad boy is handmade and a fantastic price for a handmade product using upcycled wood. Every farmhouse kitchen needs a serving tray and this one is absolutely beautiful! This Farmhouse Tray will look beautiful used with other accessories or by itself. Plus? The price isn’t too terribly bad either. No farmhouse kitchen is complete without a few glass jars showcasing dry goods and these Anchor Hocking 1-gallon glass jar with chalkboard label are absolutely perfect. Each one is a 1-gallon size and comes with a chalkboard label to finish out that farmhouse look you’re going for. Once upon a time, I had my entire kitchen decorated in cows. Hey, cut me some slack. I was young. While I now feel that an entire kitchen full of cows might be overkill, I absolutely adore this Farmhouse Cow Wall Decor. It’s simple, well made and fits with a farmhouse kitchen decor them perfectly! 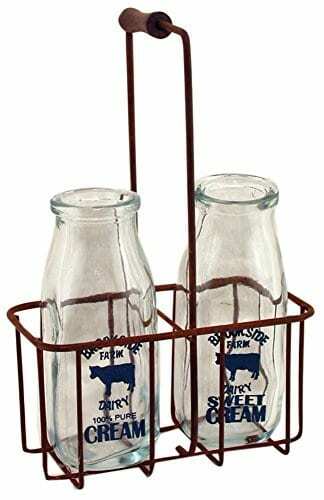 No farmhouse kitchen is complete with out a milk can and this galvanized steel Primitive Milk Can is just what you’ll need. It would look fantastic sat on the floor or table with flowers for a centerpiece. 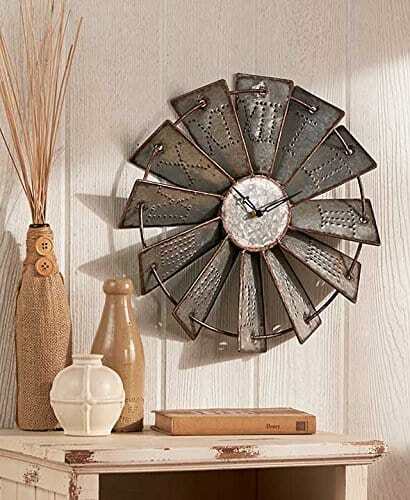 As I was writing this post, I came across this Metal Windmill Clock and immediately used a few Amazon gift cards that I had earned free to buy it. I can’t help it! I fell in love with it and had to have it! It will look amazing in my kitchen and just as great in your stoo! 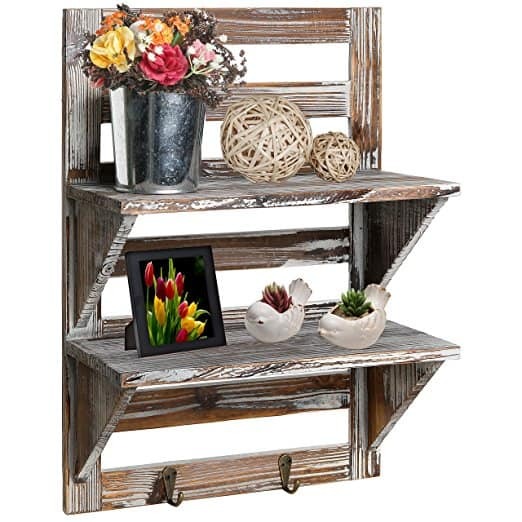 You’ll need a way to display all of these beautiful accessories and this Rustic 2-tier Wall Shelf is perfect for just that! It is a 2-tiered shelf that hangs perfectly for displaying small artwork and more! Plus the two hooks on the bottom can be used for hanging aprons, kitchen towels or potholders to complete the look! 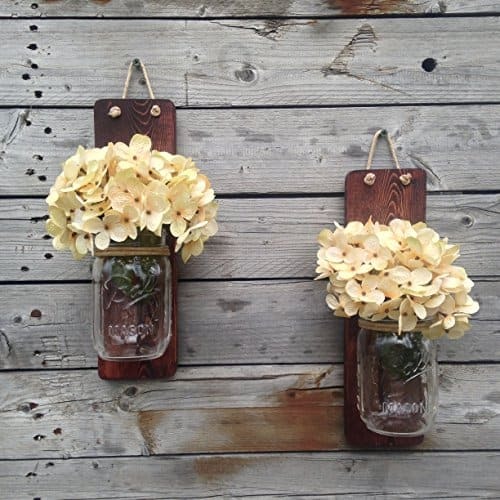 If you’re looking for a fantastic way to give your kitchen a feminine touch, these Mason Jar Wall Sconces are perfect! Fill them with your favorite flowers or add a battery operated tea light candle to each and create a romantic, but soft mood that is incredibly simple! Your kitchen table is also part of your farmhouse kitchen decor which makes these Lillian Rose Food and Family Silverware Holders perfect. Even better is that you can usually pick up a set of 4 for less than $10.00 making them both perfect for your own home but gift giving as well! 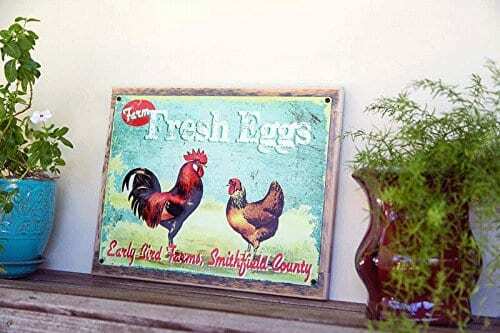 No farmhouse kitchen decor theme is complete without a sign advertising your fresh eggs! This Framed Fresh Eggs Sign is perfect for adding that farmhouse look and a pop of color to your kitchen while staying within your budget! Keeping your fruit in a place where it is easily accessible but won’t spoil is a must have for keeping your kitchen waste low and these Chicken Wire Hanging Fruit Baskets are the perfect fit for a kitchen decorated with farmhouse decor! They’re minimal but effective and even better? Budget friendly! No kitchen is complete without a great looking clock and I absolutely adore this Farmhouse Wall Clock . It’s simple but beautiful and is sure to add a pop of class to any farmhouse kitchen. Actually this would look amazing in any room with a farmhouse decor theme! 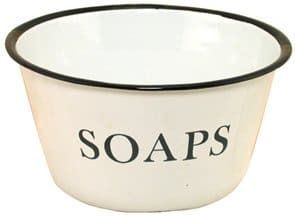 Whether you use it as a soap dish or you repurpose it into something else, there is no denying how adorable this Enameled Metal Soap Dish would look in a farmhouse kitchen! More chicken wire! This Chicken Wire Paper Towel Holder will look amazing hanging on the wall beside that fresh eggs sign earlier in the post! 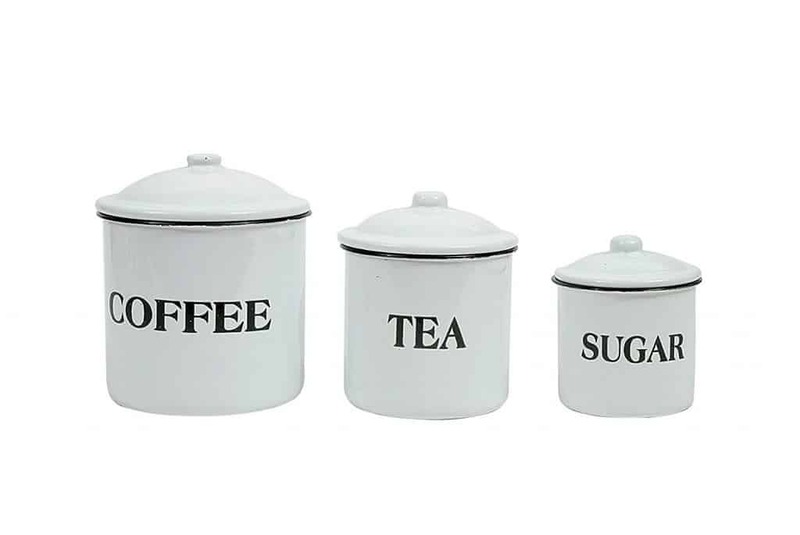 Grab your coffee cup and make yourself a cuppa from this absolutely adorable 3-piece Metal Canister Set! It’s perfect for any kitchen decor really, but will look especially great in a farmhouse kitchen! Round out your fruit and vegetable storage with these Chicken Wire Fruit and Vegetable Storage Bins. Mounted to the wall in your pantry, they’ll add a touch of farmhouse where there normally wouldn’t be any. No kitchen is complete without a great rug in front of the sink and this Burlap Rooster Rug will fit in perfectly with your farmhouse kitchen decor! It’s the perfect size and looks amazing! Kick up your storage options a notch with these super cute White Farmhouse Baskets! They come with chalkboard labels to help you keep track of what is supposed to go in them. Could they be any cuter? I will admit that I totally love this Antique Style Wooden Serving Tray and may have ordered one for myself! It will look fantastic on the counter with some flowers and other decor pieces to really bring out its beauty. Bring a touch of the farm to your dining room table with this Galvanized Steel Napkin Holder. Simple but attractive, it will definitely add to your farmhouse look! Anyone else have a ton of kitchen utensils cluttering up a drawer? This Country Kitchen White Utensil Crock will fix that issue! I love how it is so simple and clean but manages to be adorable too! Crates are great for decor in any room, but these Rustic Wooden Crates will look absolutely amazing in a corner of your kitchen! Use them to store vegetables, pots and pans or just stack them for a true farmhouse look! Burlap adds a touch of country to any home and these Farm Fresh Burlap Popcorn Bags are no different. Use them as placemats, stage them on the wall in a great layout or whatever! I’m sure you can find something to use them for. They’re too cute not to! While this Black Distressed Metal Coffee Pot isn’t meant to be used for coffee, it will look absolutely amazing on your stove as an accent piece! Need a place to organize snacks and other small kitchen items? These Galvanized Steel Tubs are perfect! They’ll help you stay organized and stay on the theme of your decor! This Rustic Barnwood Window Frame is perfect for adding a touch of the farm to your decor. Frame it on the wall with other amazing pictures and wall hangings and you’ll be looking great! Remind your friends and family what kitchen gatherings mean in your home with this super cute Rustic Kitchen Gatherings Wall Sign. It will look great having above any kitchen doorway or back door. I love the use of old wooden ladders in any home decor theme, but using this Reclaimed Wood Ladder to hold your pots and pans like this is genius and gorgeous! Need a handy dandy place to store your spices? 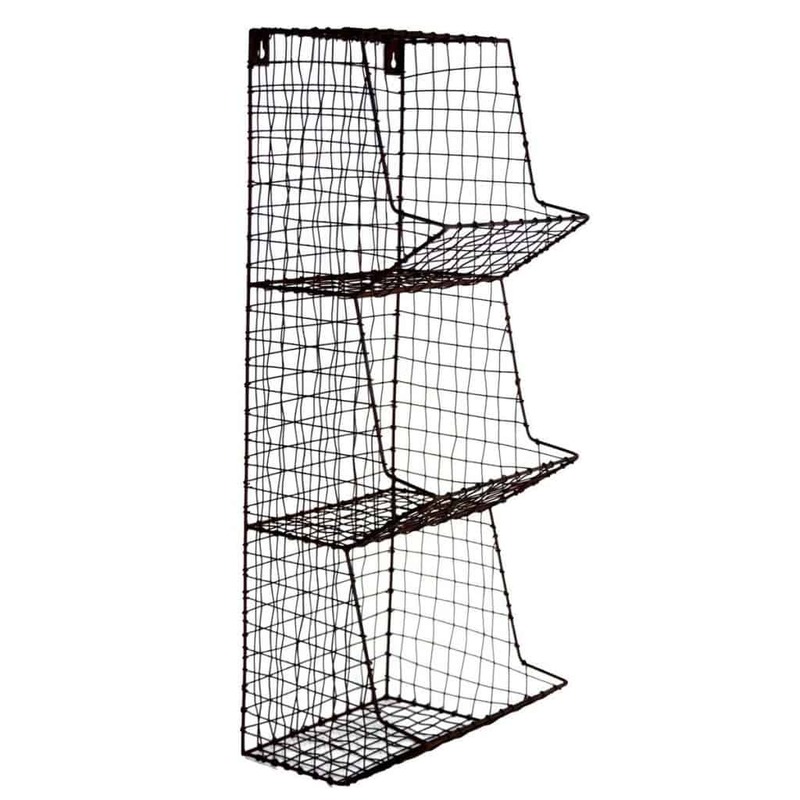 Check this Chicken Wire Spice Rack out! It holds quite a few bottles and will look amazing surrounded byt he rest of your decor! Have a breakfast nook? This Tin Good Morning Sunshine Wall Decor is the perfect accent to welcome a new day! Looking for a simple table centerpiece? Fill these Glass Milk Bottles with Carrier with flowers and call it a day! How cute will that look?! 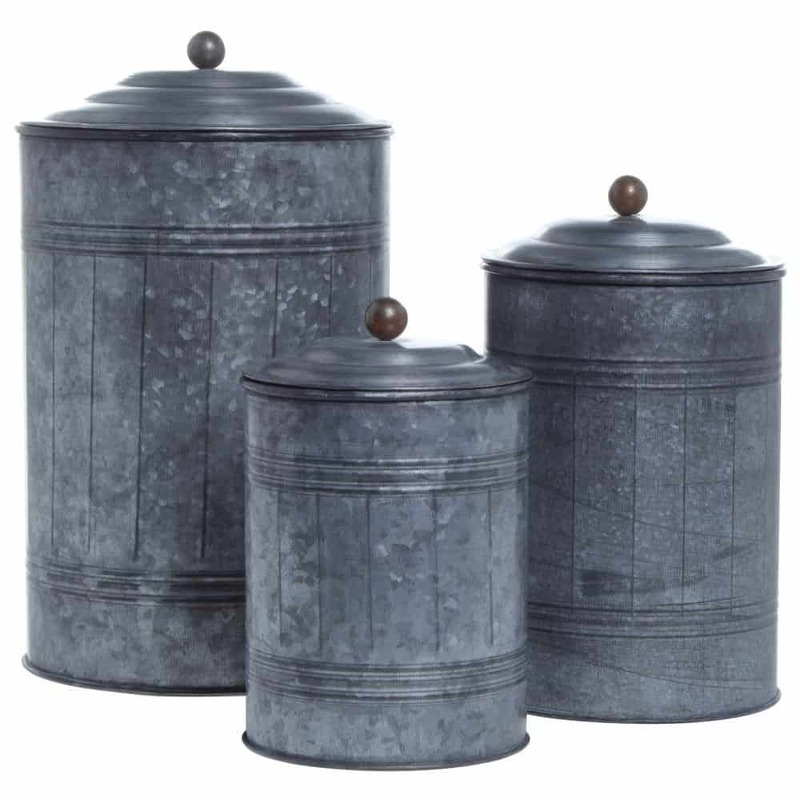 These Galvanized Steel Canister Set aren’t for food, but they’ll look amazing stashed in a corner of your farmhouse kitchen! Super cute and while y ou can’t store food in them, you can store other things you’d like to keep out of sight! See? Decorating for a farmhouse kitchen doesn’t have to be expensive! 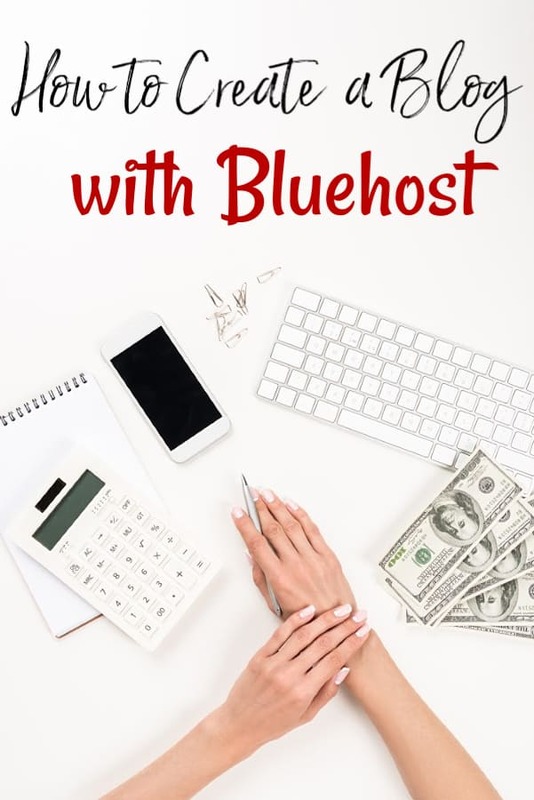 You can get the look for less if you do just a bit of research! Now if you’ll excuse me, I’m off to add my own new decor items to my own farmhouse kitchen. They’re going to look amazing!